What’s the Real Purpose of Your Web Site? – Have you asked this question of yourself and your web site lately? 1. Is the reason … ’cause all other businesses have one. If so, you really need to rethink this business strategy. 2. Is the reason … Just to have more traffic? You can have 1M people come to your site, but are they converting into customers? Providing more business? 3. Is the reason … to drive potential customers to your business? If so, HOW? Do you want them to ultimately CALL YOU? Where is your phone number on your site? Can you find it on every page, every header, every footer? 4. Is the reason … to inform your current customers about your ‘latest news’? A monthly NEWSLETTER might be a new idea, or an added communication tool? 5. Is the reason … To gather information on a potential customer? Do you have a clear C2A (Call to Action) to ‘Contact Us’, or fill out your online form? What colors are you using for these C2A buttons / images? Are you using complimentary colors, colors that blend in, or colrs that really attract attention? Are your buttons clear, truthful and informative? Which is better … ‘Click here for Further Information’ or ‘Contact Us’? 6. Is the reason … To drive people to make an online purchase. If so, you really need to streamline this process. Make is as simple as humanly possible. Do your thumbnail images work properly? Where in the sales process funnel do people leave or abandon the shopping cart? 7. How is your Contact Us form constructed? Oftentimes, if you have too many ‘required fields’ or if the form is more than 8-10 fields, than people will simply LEAVE. Think about what you really need from a potential customer. Maybe just their name, email address, ph# and one option field would be enough. Google Analytics can be a great tool to determine answers or provide you information about how your site functions. We can easily set GA up to determine how many ‘Contact Us’ forms are filled out, or how many PDFs are downloaded, or where customers are leaving your sales process funnel, etc. Websites play a significant role in building and strengthening brands. Whether you’re re-launching a website or introducing a new one, it’s a powerful opportunity to position your company for success. “Today’s consumers are increasingly likely to first encounter your brand online than off, and even those who get their first impression of your brand in print often follow up with a Google search,” reports Business News Daily. About 75% of Internet users make judgments about a company’s credibility based on its website design, according to Stanford University research, so a site must be visually appealing. But looks aren’t everything. Consumers also demand a great deal of functionality from a company website. Rich's Web Design - July Newsletter - What's the Real Purpose of Your Web Site? 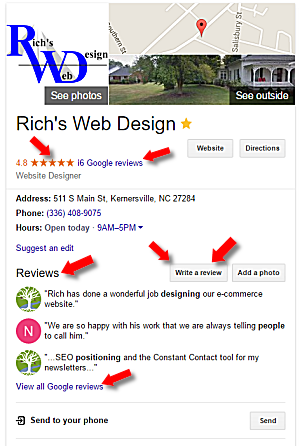 - Local SEO Checkup - 5 Keys to a Killer Web Site.